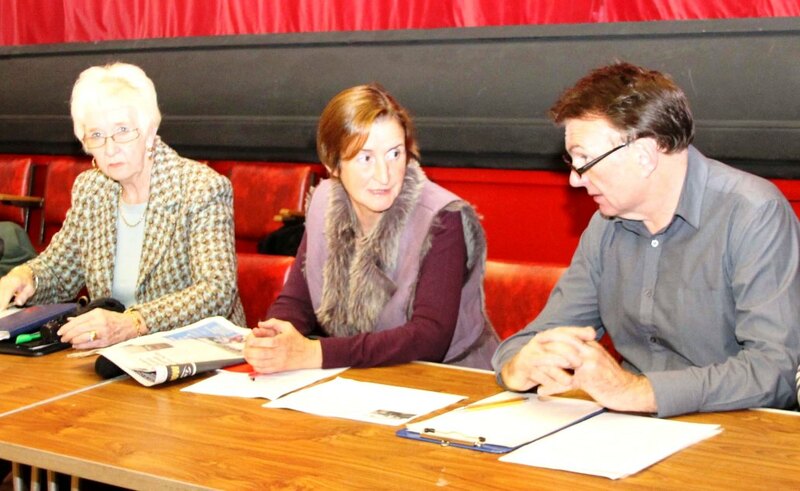 Cllr Pat Jones, Nia Griffith MP and Cllr John James at an earlier public meeting about the footbridge in Burry Port. Nia Griffith MP and Burry Port County Councillors Pat Jones and John James have been to Cardiff to see Network Rail’s Route Managing Director for Wales Mark Langman about the footbridge over Pembrey and Burry Port Station. The meeting was convened to coincide with the completion of a condition survey of the bridge, that Network Rail staff said they would carry out when they first met local politicians about the bridge back in the autumn. Whereas last October, Network Rail staff had plans to demolish the bridge, the new report identifies two levels of refurbishment, one which would put the bridge right for 20 years at an estimated cost of £150,000 or a more extensive job costing some £280,000 which would give the bridge a 50 year life extension. Mr Langman explained that as Network Rail had only budgeted on £50,000 to £60,000 for the demolition of the bridge, this left them short even for the cheaper option.